The Woburn Methodist School has been completely rebuilt by the Government of Grenada and was occupied at the start of the third term. Government funded the construction of the beautiful new facility, but it was left to the school to provide much-needed new furniture. Gift Grenada, Inc. is a local registered non-profit company organized to perform charity work with its primary focus being support to the primary schools. Woburn Methodist is one of four schools adopted and supported by Gift Grenada. When it was learned that Woburn Methodist needed furniture, contact was made with Surplus Educational Supplies Foundation (SESF) of Scotland, United Kingdom. Mr. David Miles-Hanschell is Chief Executive and Founder of SESF. He is a retired school teacher who began in 2004 to collect used school furniture and supplies for shipment to developing countries. Over the past decade he has shipped to Ghana, Nicaragua, Liberia and Jamaica, in addition to Grenada following Hurricane Ivan. 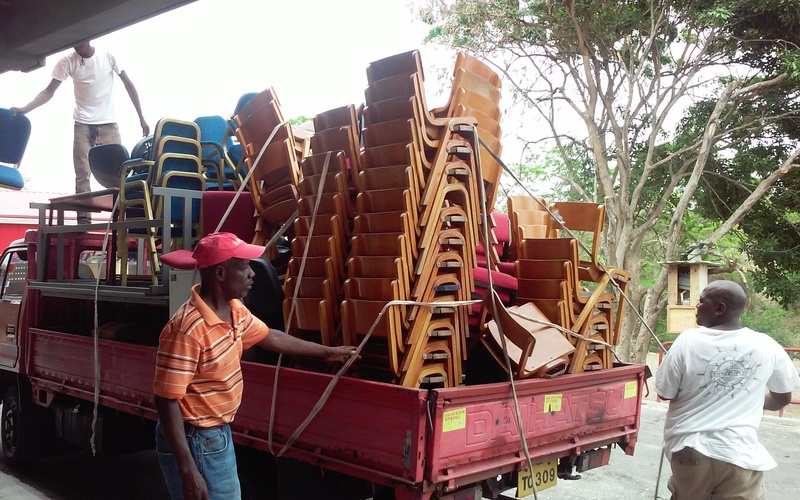 It was most fortunate that Mr. Hanschell had on hand a forty foot (40’) container loaded with school furniture which he readily agreed to send to Grenada for Woburn Methodist School. Over the past several months David continued to collect books and supplies to include in the shipment while arranging transport of the container from Scotland to Portsmouth, England. Several organizations, too many to recognize here, donated their services to make this happen. One in particular, NGL – Noble Global Logistics, U.K. Ltd., managed by Mr. Ioannis Kottoros was instrumental in arranging and organizing the many logistical hurdles involved. From Portsmouth the container was shipped by Geest Lines to Grenada. Gift Grenada, Inc. has paid the shipping costs as well as clearing agent’s fee and transportation costs from the port to the school. Mrs. Annie Vidal of Pt. Salines is a strong supporter of Gift Grenada. She and her talented team of housewives created many beautiful handicraft items for sale at a Craft Show held at her home. The proceeds more than covered the cost of the shipment. Another craft show/fund raiser is planned for November, 2016. Your timely assistance (financial and other wise) in helping to facilitate firstly; this container of furniture and school supplies from an international source; then all of the shipping arrangements and the behind the scenes work to get it to us here at the Woburn Methodist School all the way from Scotland, demonstrates your deep commitment to our school as we work in partnership in fulfilling our mandate of inclusive education through closer collaboration with our co-operate citizens local and foreign. As we begin afresh at our new facilities the need for furnishings was paramount and you came at the right time to fill this void. Such generous gifts from donors like you provide the material and moral support to needy students and institutions like ours so that we can continue our mission of providing a balanced, well rounded education to our nation’s boys and girls. Your support will play a pivotal role in our success as a learning institution, where we strive to reduce illiteracy through the infusion of technology into our classrooms and at the same time endeavour to enhance student’s performance in literacy and numeracy. Words in no way can fully express our gratitude to your organizations. Hence, we will be continually inspired by your dedication and generosity. On behalf of the Ministry of Education and Human Resource Development, the Methodist School Board, PTA Body, Staff, students and myself (Principal) I extend to you a warm and most heartfelt thank you. We look forward to a continuing partnership with you. Your kindness is very much appreciated. From: The Principal, Staff and students of the Woburn Methodist School.